Lesotho, a country, is located in Africa. Maseru is the capital and the largest city in Lesotho. Also the country is the member of the Commonwealth of Nations. It is interesting to know that Lesotho means the "Land of the People who speak Sesotho". Lesotho's early inhabitants were the Khoisan people who were native to southern Africa, followed by the Bantu people who migrated from central Africa. The Bantu people who settled in the mountains and plateaus of southern Africa were the Sotho-Tswana people, who migrated by the 11th century. In 1822, the region was united by King Moshoeshoe I, who was formerly a tribal chief in Butha-Buthe in the mountains of Lesotho. During this period, the land was called Basutoland. The Europeans arrived in South Africa and began to colonize the region, first with the Dutch and French establishing settlements in what is now South Africa, and later the British, who began to attempt to take over the Dutch establishments. The Boers, who were the farming people of the Dutch settlement in South Africa began encroaching on the Basutoland territory. This ignited a war between the Sotho people of Basutoland and the British, and after their departure in 1854, the war continued with the Boers. Basutoland became a British protectorate in 1868, but the British annexed some of the kingdom's territory, giving almost half of it to the Boers. After King Moshoeshoe's death in 1870, the country began to be ruled by the British as a colony, leading to the Gun War in 1881 between the people of Basutoland and the British in control. In 1966, Basutoland became the sovereign Kingdom of Lesotho in 1966. The new-found independence ushered in a period of internal conflict, with warring national parties and an eventual coup, installing King Moshoeshoe II as its monarch in 1986. Just a year later, he was forced to abdicate, and was replaced by his own son, King Letsie III. Moshoeshoe II returned from his exile, and King Letsie campaigned for his father's return to power until Moshoeshoe's untimely death in 1996. Internal conflict persisted, leading to riots and fighting. Finally in 2002, Lesotho enjoyed peaceful elections. Lesotho is an enclave entirely landlocked and surrounded by South Africa. Lesotho is completely landlocked, and is the only country in the world that sits at an elevation above 1,000 meters (3,281 feet) across the whole nation, earning it the nickname, the Kingdom in the Sky. In fact, the majority of the country sits above 1,800 meters (5,906 feet). The mountains of Lesotho are covered in snow for several months of the year, with higher points snow-topped throughout the year. 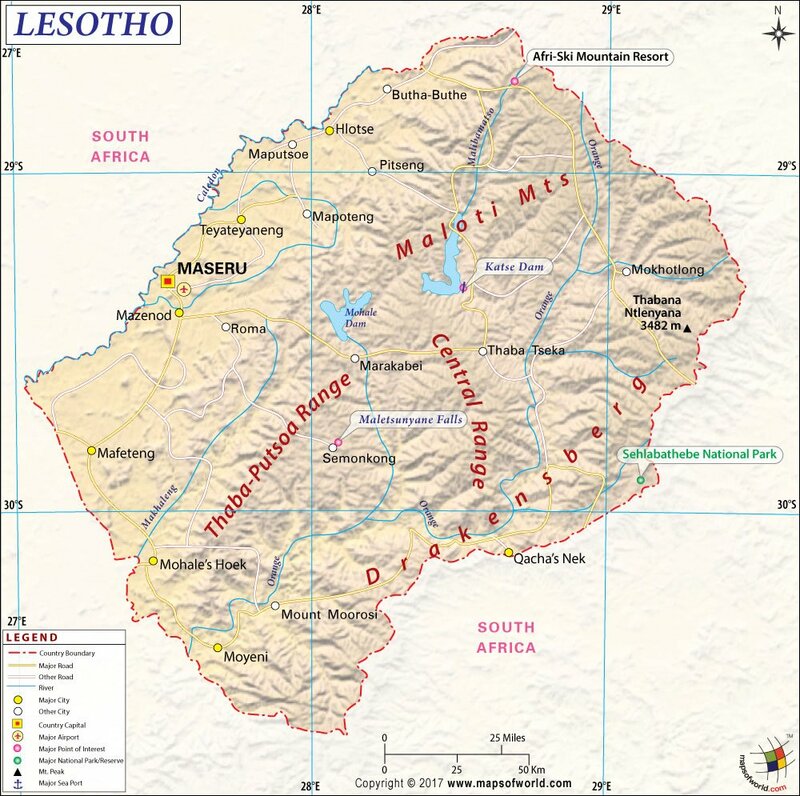 Lesotho's lowest point is the highest of any country's lowest point in the world, at 1,400 meters (4,593 feet). Lesotho is situated in the Drakensberg and Maloti Mountains, with areas of foothills and relative lowlands included in its territory. The main rivers in Lesotho are the Caledon River, which flows along the northwestern border, the Orange River that flows through the Drakensberg Mountains, the Senqu River valley, and the Malibamatso, Matsoku, and Senqunyane Rivers. Because of its high altitudes, Lesotho is a great destination for skiing and snow sports, with Afriski and Oxbo as some of the best locations. There are many destinations to experience the scenic outdoors, including the Bokong Nature reserve, with an impressive waterfall, called Lepaquoa, which appears as a frozen waterfall during the coldest months. Ts'ehlanyane National Park and Sehlabathebe National Parks offer hiking and outdoor recreation, and the latter features ancient artwork and sites of ancient cultures. Lesotho is home to one of the tallest waterfalls with just one drop, called Maletsunyane Falls in Semonkong. The capital, Maseru, offers shopping and plenty of services for travelers. Markets for some of the best handicraft shopping in Lesotho can be found in Leribe and Teyateyaneng. Lesotho's main airport is the country's only international airport, Moshoeshoe I International, which is located outside of Maseru. Around the country, there are some paved roads in the major centers, and one rail line from Maseru to South Africa's Bloemfontein and Bethlehem, though plans to expand the rail system are in the works. Riding horses and donkeys are a common method of transport around the country, as well as carts drawn by these animals. On the 40th anniversary of independence, Lesotho adopted a new design for the flag. Major ReligionReligion in Liberia. According to the 2008 National Census, 85.5% of Liberia's population practices Christianity. Muslims comprise 12.2% of the population, largely coming from the Mandingo and Vai ethnic groups.